Weathering means that due to their chemical composition steels exhibit increased resistance to atmospheric corrosion compared to unalloyed steels. The corrosion retarding effect of the protective layer is produced by the nature of its structure components and the particular distribution and concentration of alloying elements in it. The anticorrosive properties of weather-resistant steel are based on the protective oxide layer, called patina which forms on the surface of the steel. Under normal weather conditions the patina will form in about 18–36 months, if the surface is alternately wet and dry. At first, the patina is a reddish brown color, but with time takes on a darker hue. In industrial environments, the patina forms more quickly and is darker in color than in rural areas. In marine environments, the formation of the protective patina may be slower due to chloride exposure. The anticorrosive properties of weather resistant steel are better than those of other structural steels in many applications. The steel is self-protecting: the rust layer on the surface becomes a tight oxide layer that slows down the progress of corrosion. The steel is an economical, long-lasting and fully recyclable material. The layer protecting the surface develops and regenerates continuously when subjected to the influence of the weather. The corrosion retarding effect of the protective layer is produced by the nature of its structure components and the particular distribution and concentration of alloying elements in it. The layer protecting the surface develops and regenerates continuously when subjected to the influence of the weather. Formation, duration of development and protective effect of the covering layer on weathering steels depend largely upon the corrosive character of the atmosphere. Its influence varies and depends mainly upon general weather condition (e.g. continental) macroclimate (e.g. industrial, urban, maritime or countryside climate) and the orientation of the structure components (e.g. exposed to or shaded from the weather, vertical or horizontal position). The amount of aggressive agents in the air has to be taken into account. In general the covering layer offers protection against atmospheric corrosion in industrial, urban and countryside climate. When utilizing this steel in unprotected condition it is up to the designer to take into account the expected loss of thickness due to corrosion and as far as necessary, compensate for it by increasing the thickness of the material. In cases of particular air pollution by aggressive agents conventional surface protection is recommended. Coating is absolutely necessary in cases of contact with water for long periods, when permanently exposed to moisture, or if it is to be used in the vicinity of the sea. The susceptibility of paint coats to under creep age by rust is less in the case of weathering steel than in the case of comparable non-weathering steel. United States Steel Corporation (“U. S. Steel”) developed COR-TEN Steel as part of a family of proprietary High Strength Low Alloy steels for use in a wide-ranging array of applications. These steels were generically referred to as “weathering” steels. COR-TEN Steel was promoted for buildings, bridges, shipping containers, highway guide-rails as a bare weathering steel. To use the benefits of the higher atmospheric corrosion resistance of COR-TEN in comparison to unalloyed steel it is necessary that design and execution of structures as well as the performance of maintenance works allow an impeded formation and regeneration of the protective rust layer. The methods must meet the latest requirements of technical progress and must be suited for the proposed application. In order to obtain fine grain structure a sufficient amount of nitrogen absorbing elements is added (e.g. ≥0.02% Al). 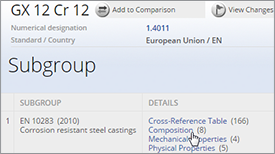 Table 2 shows the mechanical properties of CORTEN steels for plates in the state of hot rolled delivery condition according to EN 10025-5. In case of cold rolled CORTEN A, the yield stress is min. 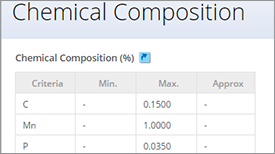 310 MPa and the tensile strength is min. 445 MPa. The cold rolled sheets COR-TEN A-B ≤3mm in thickness for increased demand to the cold formability the mechanical properties is slightly different i.e. the yield stress is min. 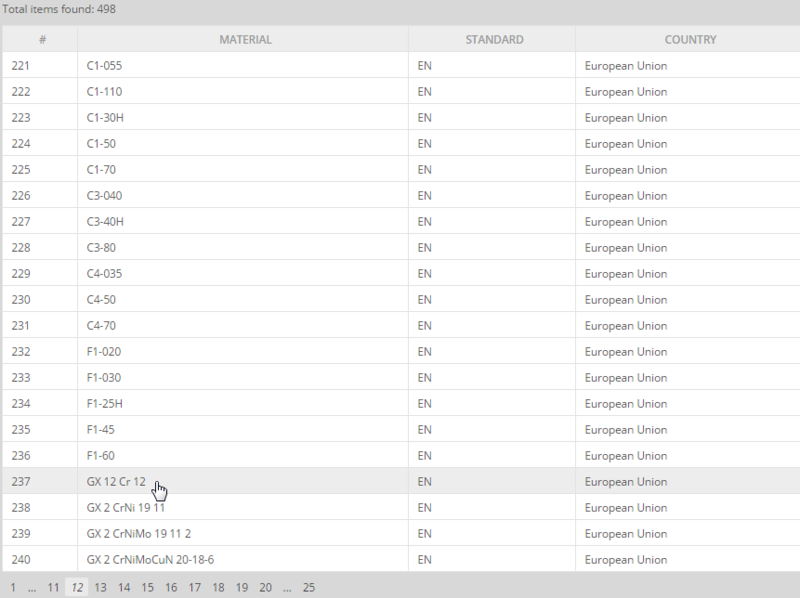 275 MPa; the tensile strength min. 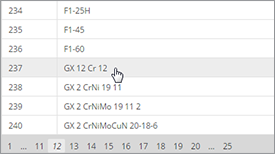 410 MPa and the elongation min. 25%. The different rates of corrosion are experienced in different atmospheres. As part of an international CORTEN corrosion data collection programmed, MITTAL Steel South Africa established test sites in typical rural, marine and semi industrial environment. Sixteen years of data have been collected and the results are reflected in the accompanying graphs. 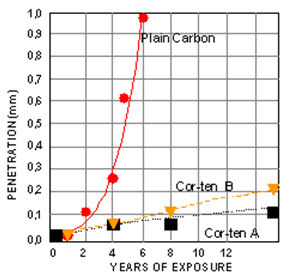 Figures 1 to 3 compare the corrosion performance of COR-TEN A with the plain carbon steel in three different environments. Figure 1: Average corrosion penetration, rural environment. Test site situated 8 km east of Pretoria city centre. 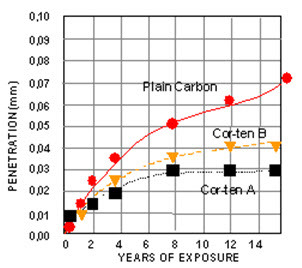 Figure 2: Average corrosion penetration, rural-marine environment. Test site situated about 30 km south of Richards bay, 100 m above sea level and 500 m from the beach. 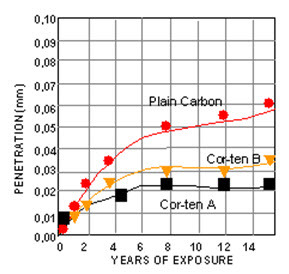 Figure 3: Average corrosion penetration- semi-industrial environment. Test site situated 8 km east of Pretoria city centre. The results of tested materials showed that the COR-TEN steel has enhanced better atmospheric corrosion resistance when compared with ordinary carbon steel. On the other hand, under continuous wet or buried conditions the corrosion rate of COR-TEN may be the same as carbon steel, as the patina does not stabilize and is therefore not recommended. In marine environments stable oxide films may form on the steel, provided chlorides are washed off regularly. Normally the use of unpainted COR-TEN is not recommended for applications subjected to salt spray. 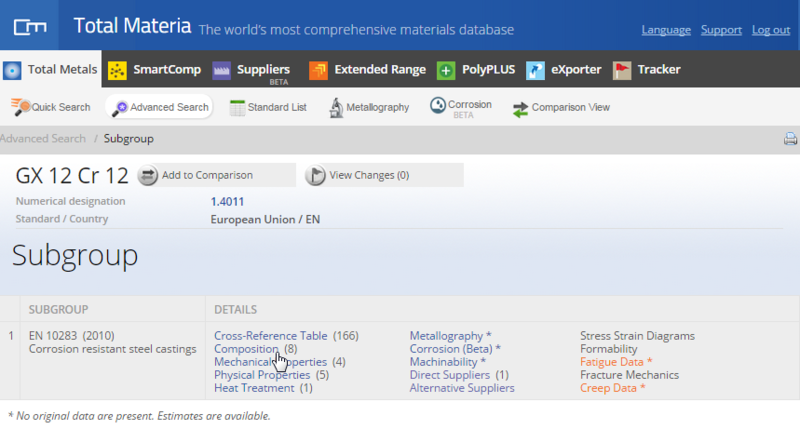 The Total Materia database contains many corrosion resistant materials across a large range of countries and standards. 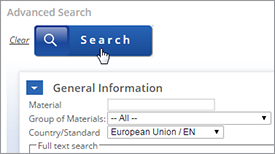 Using the Advanced Search page, it is possible to search for materials by their key descriptive words detailed in the standard title by using the Standard Description function of Advanced Search. 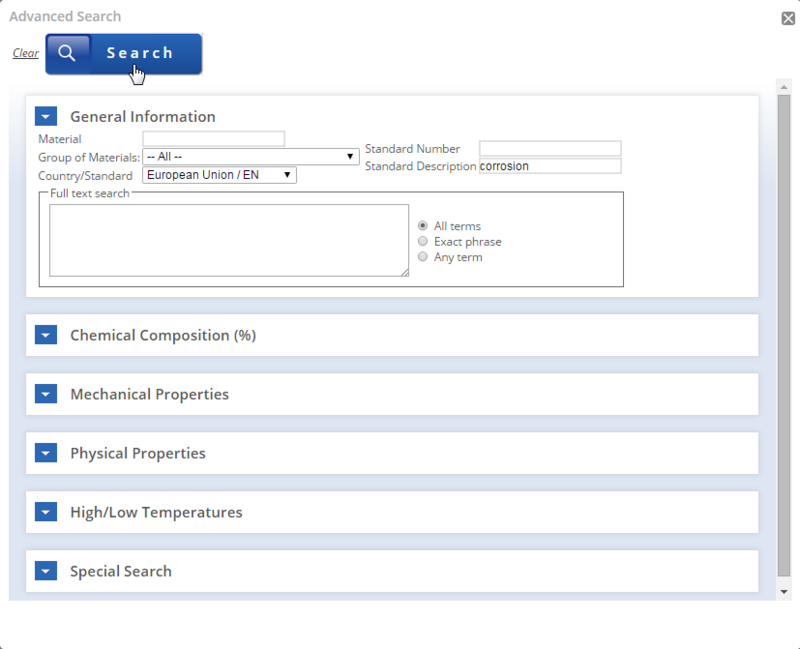 It maybe that you need to further narrow the search criteria by using the other fields in the Advanced Search page e.g. Country/Standard. 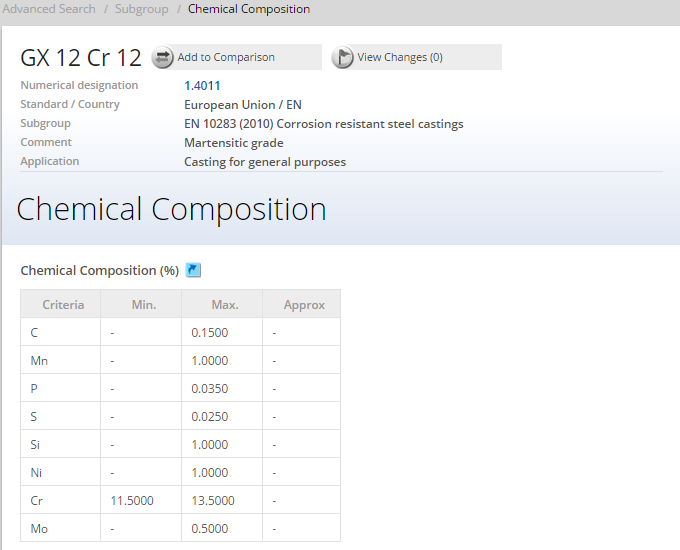 For example, by clicking on the chemical composition link on the subgroup page it is possible to view chemical composition data for the material.